Quickly lists your available boot volumes and reboots. Is there a better alternative to QuickSwitch? Is QuickSwitch really the best app in Applications category? Will QuickSwitch work good on macOS 10.13.4? QuickSwitch is an application that changes setting of a start system (possible as for the CD, the DVD) without a Startup Disk of system preferences. QuickSwitch.app quickly lists the volume that can boot, and reboots a machine after setting. 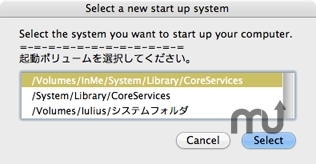 An error that occurs at one partition constitution which have two or three (OS9 and OS X) system files was corrected. QuickSwitch needs a rating. Be the first to rate this app and get the discussion started!